Unique character log home in peaceful setting. Perfect for artists and writers or as a romantic getaway for couples. This log cabin has plank flooring throughout. Bold rock fireplace. Old antique cook stove in kitchen . The stove is for decoration only. There is a modern electric stove for cooking. claw tub and shower in the modern bathroom. Keywords: Lake access, unique, log cabin. Please note: The cabin beds are supplied with bottom sheets and pillows/pillowcases. In order to keep the cabin rates reasonable, we ask that guests bring their own top bedding (blankets, etc) and TOWELS. Just a few minutes walk to the lake. We have no satellite service or cable or tv service. We have a collection of books to enjoy. Bring a few to swap with ours. The cabin is only a short walk to the lake. Bring your canoe or boat. There is a government. Access road to the lake. The perfect getaway from city life! No cell, no tv, no internet. Just you and the bush, the lake and some great fires at night. Such a beautiful cabin! Felt so cozy there and slept amazing in the beautiful upstairs bedroom. Just a quick walk and you are at the lake.. a small little community is there and everyone we passed said hello and greeted us with warm smiles. A lovely place to get away and relax away from it all!!!!! A perfect private getaway ! We just returned from 10 days at the little cabin in the woods! It was exactly as it was described and more. We went on some great hikes to the falls and whale lake. There is a small walk around beaver lake just outside our door. The very short walk to canim lake was great. We kayaked everyday, either up the lake to red creek and part way up the creek or up the other way to admire the cottages and shoreline. Loons followed us every time. We read in complete solitude every morning and almost wished for rain so that we could stay inside this amazing cabin all day! We spent one evening with some of the neighbours which was unexpected but a really fun evening hearing stories about the history of the area (the neighbours are not even within your sight) We most enjoyed our quiet time, games, cards, reading and napping! 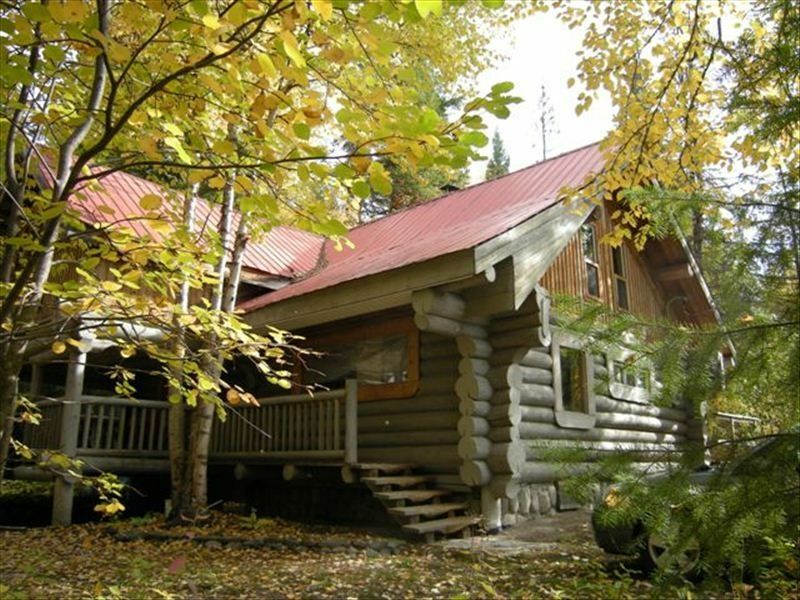 A perfect vacation in a well equipped comfortable cabin in the woods! My friend and I spent a wonderful 7 days in this delightful cabin! We had both brought projects to work on and the lack of distractions helped us accomplish a lot. The cabin is surprisingly spacious, the kitchen well-stocked and the beds very comfortable. It is furnished in such a charming style with lots of cosy sitting areas and large windows. We swam in the lake, visited 2 waterfalls and went on lots of walks. My little dog also enjoyed it too! We hope to be able to return again soon! I spend two week with my dad fishing. We have explored the Cariboo and surroundings beautiful nature. The cabin provided great accommodation in traditional Canadian style. We have realy enjoyed the stay and can recommend it to anyone. We have been very well looked after as the BBQ gas run out, Joann came the same day to replace it. Also recommend it to fisherman as we have caught loads of different types of fishes. The minute you walk into to this cabin you are home. Beautifully appointed and so comfortable, we didn't want to leave. The lake was great fun, lots of swimming , the campfires were the best. We took a day trip to Mahood and Canim falls, easy hike and so worth it. Our hosts made sure we had all the information we needed for our stay. Out of every window you saw new beauty and the front porch was made for sitting and staring!! The cabin is supplied with bottom sheets and pillow/pillow cases. I order to keep,our cabin rates reasonable we ask that guests bring their own bedding and towels. These are available for an additional fee if arranged in advance.